Everyone has those moments in life when they’re truly tested, when they wonder if they have the strength to overcome the challenges before them. We’ve all heard stories of people who have risen up in the face of the unimaginable. But not everyone believes that they have what it takes to do the same. However, what we need to realize our own potential—to fight for what we want our lives to be—already resides within each of us. You already have the Stuff. Learning how to develop and harness it is the key. Survivors themselves, Dr. Sampson Davis and Sharlee Jeter have created The Stuff Movement, interviewing dozens of people to find the common threads that enabled them to triumph over their challenges. Through the powerful stories of people who overcame cancer, poverty, toxic relationships, racism, violence, career roadblocks, and other obstacles big and small—The Stuff highlights eleven core elements that will help you not only survive but thrive in spite of life’s difficulties. These elements are as easy to understand as they are to enact—presented in plain talk, without judgment, and with compassion for the everyday challenges people face. As Dr. Davis and Sharlee share stories of the amazing people who’ve shown their Stuff, you’ll find that unearthing the same Stuff within yourself is a process as rewarding as it is important—and you’ll never say you can’t do it again. 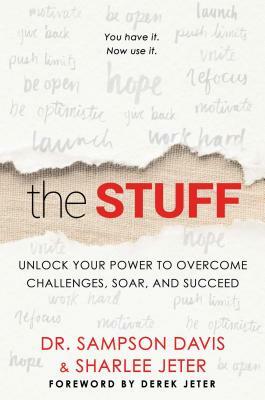 Read the book, and join the conversation at TheStuffMovement.com. Featuring stories about John O’Leary (On Fire), Mercy Alexander, Rich Ruffalo, Mindee Hardin, Glenn and Cara O’Neill, Sean Swarner, Traci Micheline, Wess Stafford (Too Small to Ignore), Austin Hatch, Debra Peppers, Christine Magnus Moore, Martha Hawkins, Ali Stroker (Glee), Susan Scott Krabacher, Deval Patrick, and more. “One of the most inspiring and motivating books of our time. Sampson and Sharlee solidify their contribution to our society by writing something that is lasting, important, and impactful—a must-read for employers and employees, athletes, parents, and students everywhere." "Dr. Sampson Davis and Sharlee Jeter find inspiration in adversity, life lessons in travail. They draw upon their own dire experiences, and those of others, to deliver a resonant message: Everyone has the Stuff. And everyone should read this book."